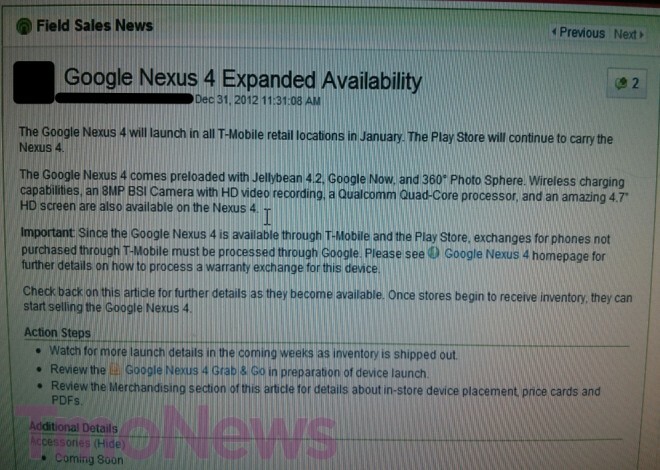 Speaking of the Nexus 4, it looks like T-Mobile will begin carrying this elusive beast in all their retail stores starting this month. If you still haven’t managed to score a Nexus 4 from Google Play and don’t mind paying an extra $150, you might want to consider walking into your local T-Mobile store to see when they’ll have them in stock. I really don’t know why anyone in their right mind would purchase a full retail Nexus 4 at T-Mobile, but hey, I’ve seen stranger things happen. However, if you’re just looking to pick up Google’s latest Nexus and really don’t care about purchasing it outright, you can always grab the Nexus 4 from T-Mobile for $199.99 with a two-year contract.